Each audio package features live broadcast recordings of Michelle Yozzo Drake's popular radio show "The Time Is NOW: Business Solutions with Michelle Y. Drake" and "Workplace Wisdom with Michelle Yozzo Drake." THE PROFESSIONAL DEVELOPMENT MASTER KIT! People who don't take control of their careers can lose upwards of a half million dollars by the end of their professional lives! Don't let that happen to you! As a Success Strategist, Michelle knows the importance of driving your career forward to earn more money, power and satisfaction in the workplace. This CD features her tips on how to boost self-confidence to earn the respect of others - a cornerstone to successful relationships - go after promotions and negotiate the salary you deserve. Is there a negative voice inside your head that keeps you from voicing your opinions at work? Does that voice tell you that you're simply not good enough, not smart enough, oh and hey, no one likes you?! Banish that voice for good as Michelle guides you toward the source and helps you push past it. Her tips on finding your inner power and overcoming feelings of helplessness and hopelessness have been gathered from experience, and her advice will leave you able to stand in your own power and set the course of your career. Is it a bad day...or a bad job? Everyone feels overwhelmed now and then, but when it becomes a daily occurence, maybe it's time to move on to greener pastures. Michelle's top 5 ways to conquer feeling snowed under at work will help you climb over your mountains of work and reach the peak of your performance. Before you make a hasty decision, let Michelle and her strategic mind assist you toward the RIGHT decision. Burst through the ceiling above you and scamper up the ladder to the highest ranks of corporate America! But you won't be going anywhere if you flub the interview. Arm yourself with the tools to make every grueling interview a walk in the park. Michelle expounds on the dos and don'ts of interviewing and reveals her top success tips for powerful interviews. Facing off against Donald Trump in the boardroom each week has made Sean Yazbeck a maestro of successful interviewing, and on this CD, he shares his best advice for nailing the most stressful interviews. Learn how to present yourself as a strong leader, manage the pressure, and ultimately land the job despite tough - and sometimes cutthroat - competition. It's the perfect job. You're the perfect candidate. So what could possibly stand in your way? Well your resume for starters. Your resume is your FIRST (and sometimes ONLY) opportunity to impress a potential employer. And if it's anything less than dazzling, consider it filed under "T" for "trashcan." How do you turn a potential stumbling block into a stepping stone? Michelle has the answers, including her Top 10 Tips for Writing a Killer Resume. BONUS: secrets to negotiating the salary you deserve. From the shine of your shoes to the grip of your handshake, you are the image you project. Projecting a professional image is a cornerstone to networking and creating professional relationships that will help you rise to the top of your career. CT State Representative Diana Urban divulges what she's learned about image as a politician - one of the most scrutinized professions there is - and her secrets for exuding power, class and charm. Stop standing around "networking" events with your hands in your pockets waiting for someone to talk to you! Having a website, a storefront, and an ad in the local paper will only get you so far. You need to embrace the world of networking in all its facets, including in-person and online. Michelle offers her insights into the networking process and how to turn an introduction or a forum post into a client. Whether or not we reach the highest echelons of our organizations should be based solely on our skills and our ability to do our jobs successfully. Unfortunately, the image we project can be the deciding factor in how far we climb. Associate Style Editor Ashley Baker of Glamour magazine volunteers to be your guide through the jungles of the workplace fashion world as she discusses Glamour's secrets for dressing to impress on the job. She reveals the Top 10 Rules for Dressing for Work and Glamour's Cardinal Rules for Anything Fashion-Related. Take a look back at the influential women in your life and you'll probably find they taught you more than just how to bake bread or sew a hem. The wisdom we've learned from our mothers, grandmothers, aunts and other female role models translates into the morals, codes and tools we implement in the workplace that guarantee our success. Michelle shares the inspirational stories of the women in her multi-generational family and tips on how to stay true to your core values. CEO of Benchmark Communications and author of "The DNA of Leadership"
The powerful rise of women to the tops of organizations and industries grows stronger every day. Judith Glaser discusses the impact of women in the workforce as employees in corporate America and as entrepreneurs. Learn the secrets of "co-creating communities" and more. Are you listening to what your team and your supervisors are saying...or are you just hearing the words? Listening is for more than just information gathering - it is a key way that people connect and form relationships. Brush up on your listening skills and discover how "listening as a leader" can catapult you into top management positions. Disc 4: What Is Your Leadership Legacy? Author of "Your Leadership Legacy"
Are you a leader or a follower? When you leave an organization, what "leadership legacy" - if any - are you leaving behind? Leadership expert Regina Maruca discusses the impact leaders have on the workplace and how to develop a powerful leadership legacy to leave behind. Develop the tools to ask yourself the hard questions about your leadership style and discern the difference between how you see yourself and how others see you with this CD. and author of "Business Class: Etiquette Essentials for Success at Work"
Technology has altered more than just our productivity; it's created a whole new set of etiquette procedures in the workplace. What rules should we be following now that we all seem to be communicating virtually? International etiquette expert Jacqueline Whitmore offers her insights into how to avoid etiquette faux pas for successful workplace interactions. Giving a presentation can be overwhelming - not to mention terrifying! What am I going to say? What am I going to wear? How am I going to get up in front of all those people?? Ease your panic and allay your fears with top secret tips from Michelle, a professional speaker with over twenty years of experience. She'll teach you how to craft a powerful presentation, what to wear to make a great impression, and how to deliver a program that will leave the audience wanting more. Author of "The Four Temperaments: A Rediscovery of the Ancient Way of Understanding Health and Character"
"The Four Temperments" is an ancient system with very modern appeal. It is your key to understanding the character of your boss, your co-workers, and even your friends and family - and when you understand someone's character, you'll know just the right buttons to push and how to communicate to get the results you want. Randy Rolfe outlines each temperament and explains how to successfully apply this knowledge to the workplace. Vice President of The Cove Group, Inc.
You've had your eye on the cutie in the office down the hall for a while, and now you're wondering if it's time to take that harmless flirtation to the next level. But is an office romance a good idea? Love in the workplace can range from the good, to the bad...to the litigious, and Michelle - with Richard Drake, her husband and business partner - discusses the dos and don'ts of water cooler wooing and how to avoid letting Cupid's arrow wound your career. and Co-Author of "Virtuoso Teams"
Discover the power of a virtuoso team: a team where not one or two of its members are stars, they ALL are. Because big talent can also mean big egos, assembling a virtuoso team is not for the faint of heart, but it IS a phenomenal way to attain the highest levels of success. Andy Boynton - virtuoso team expert - guides you through his uniquely innovative perspective on teams and how to get the most out your talent pool. What do you do when you're on a team that can't get out of its own way? Learn from Bill Fischer - virtuoso team expert - as he discusses how to promote productivity within teams and achieve the ultimate results on every project. He also shares the valuable insights he's gathered as a professer at IMD, one of the world's top business schools, on all things team related. Teams are an essential part of success, but just because you're working with a group of people, does that mean you're part of a team? Functioning work groups often masquerade under the guise of teams, and even if they've been moderately successful so far, to reach your company's highest goals, your work group needs to transform itself into a cohesive team. 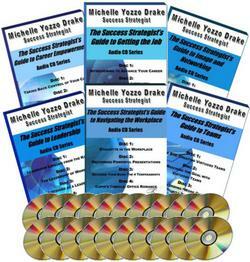 Michelle uncovers the secrets to building a powerful team dynamic for limitless success! All the tools you'll need to skyrocket your career to the highest levels of success! OUR PRICE TO YOU: Only $149.99!! !